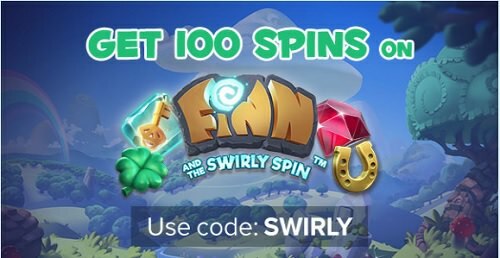 This offer is only valid on your first deposit of minimum £10 upon entering promo code SWIRLY in the cashier. The 100 spins will be credited in 5 batches of 20 spins per day, each valid for 24 hours. Valid on your first deposit of minimum £5 upon entering promo code WILD into the cashier. A maximum win of £3 from each 20 spins batch will be credited to the bonus balance. Spins carry a 25x wagering condition on selected games. Upon completion of the required wagering conditions and wagering your deposit amount at least once you will be eligible for winnings up to a maximum of £250. Available between 00:00 and 23:59 on January 31, 2018 only!. Free spins winnings paid in bonus and capped at £2.50. Lucky Pants Bingo is offering 200 spins on Lucky Leprechaun! A maximum win of £3 from each 20 spins batch will be credited to the bonus balance. Spins carry a 25x wagering condition on selected games. Upon completion of the required wagering conditions and wagering your deposit amount at least once you will be eligible for winnings up to a maximum of £250. Hey LBB'ers, visit Bingorella today and try to be very very fast! Deposit a minimum of £10, on Friday, February 09, 2018, using code RACE and you will receive 30 free seconds to play on Froots. You will receive 30 seconds for free, so your game will have a timer and you will be able to spin as many times as you can until the time is up! Code can be used once per player. Free Spins winnings are capped at £1 and paid out in bonus that must be wagered 50x before being cashed out with its respective winnings. Deposit using code DINO today, February 13th! Maximum 10 free spins per player per day. Free spins winnings paid in bonus and capped at £1. Winneroo and Bingorella are offering 20 Free Spins on Froots! Hey LBB'ers! Check you email, deposit a minimum of £10 today, Wednesday February 21, 2018, using code MANGO and you will receive 20 Free Spins on Froots!!! Free spins winnings are capped at £2. Get spinning in space with 30 Free Spins on Asteroids Slot! Log in to your account and take advantage of this exclusive offer today! Make a deposit using promo code SAFARI today, March 5th, and you will receive 5 Free Spins on Stampede! Maximum 5 free spins per player per day. Wagering requirements and further T&Cs apply. Hey, LBB'ers! Today only, deposit to your account a minimum of £10 using code CHIPPY and you will receive 25 Free Spins on Fish and Chips! Hey, LBB'ers! Visit Bingorella today! Promotion available between 00:00 and 23:59 on March 23, 2018 only. Code RACE required with £10 minimum deposit. Free Spins winnings are capped at £1 & paid out in bonus that must be wagered 50x before being cashed out with its respective winnings. Make your first deposit with the code: VAMPIRE and receive 25 Fair Spins to play! 18+ players only. This offer is only available to existing bgo accounts and once per person/account on first deposit. This offer is not available to customers depositing using Neteller or Skrill as a payment method. Offer is valid until 10/04/18, 23:59 BST. Code VAMPIRE must be used when depositing. Deposit £10 or more and get 75 Free Spins. Minimum deposit of £10 +2.5% fee (min 50p). You may withdraw your winnings at any time, except where we are required to withhold such funds to comply with our legal or regulatory obligations. The Company also reserves the right to charge a fee of £2.50 for all withdrawals of funds. Free Spins can only be used on Vampire Princess of Darkness slot game. There is no wagering requirement on winnings from Free Spins. Free Spins have a 3-day expiry. This offer cannot be combined with other new player offers that are unlocked following a customer’s first deposit, unless otherwise stated. Dear LBB'ers, visit Bingorella today, deposit using code SPIDER and you receive 10 Free Spins on White Wizard Deluxe! Promotion available on Thursdays only. £10 minimum deposit. Code SPIDER required with a qualifying deposit. Maximum 10 Free Spins for White Wizard Deluxe per player per day. Free spins winnings paid in bonus and capped at £1. General T&Cs apply. Deposit a minimum of £10 today - Wednesday April 25, 2018 - before midnight, using code PARTY and you will instantly receive the Free Spins. Promotion available between 00:00 and 23:59 on April 25, 2018 only. Code PARTY required with £10 minimum deposit. Code can be used once per player. Free spins winnings are capped at £3. Free spins are valid for 7 days. 50x wagering requirement and further T&Cs apply.